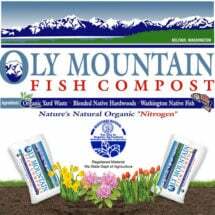 Take the time to properly plan and prepare your organic garden and it will reward you with fresh, delicious tasting tomatoes year after year. 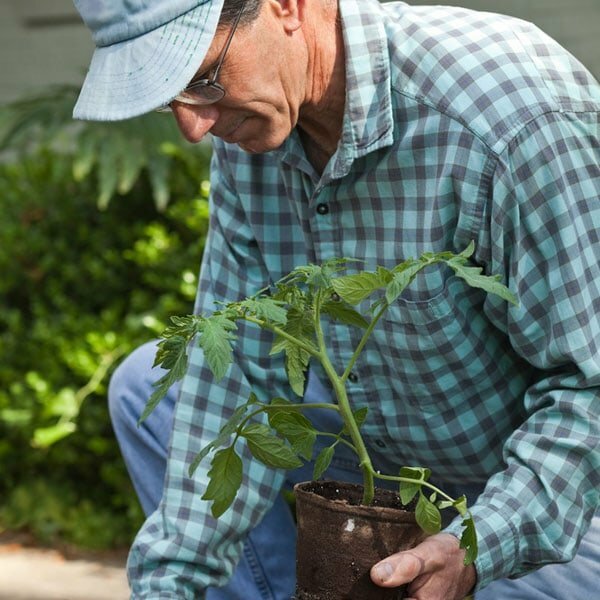 If you’ve decided to start a tomato garden — and you probably have if you’re checking out this page — you have the pick of the crop. There are hundreds, if not thousands, of different varieties. They come in all shapes and sizes including bite-size cherry and grape tomatoes (the first round, the second oval), pear-shaped tomatoes called, of all things, pear tomatoes, your garden-variety slicing tomatoes, oblong paste tomatoes like Romas, and two-pound monsters. 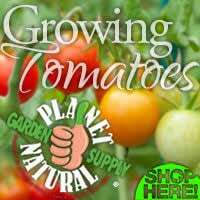 Growing your own gives you a chance to enjoy varieties and flavors that you’ll never encounter in the supermarket (click here for tomato seeds). Since tomatoes (like so many other fruits and vegetables these days) are now bred largely for easy transport, more delicate, easily bruised types have disappeared from most stores. Commercial tomatoes also have to be picked before they are fully ripe, so that they don’t peak (or rot) before they reach their retail destination, so store tomatoes rarely have the fullest flavor. Growing your own, though, means that you can enjoy tomatoes with tender skin, or easily bruised flesh. It means that you can wait until that moment of perfect ripeness before you pick the fruit — if you have the willpower, that is. All this helps explain why, for many gardeners, the great American past time isn’t baseball, it’s growing tomatoes. 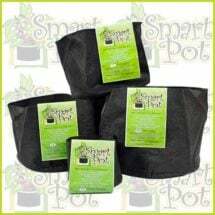 The instructions on practically every seed packet begin, “Choose a sunny location and …” Some vegetables, (such as potatoes) can get by on a few hours sunshine a day, but tomatoes truly are sun worshippers, for they thrive on both heat and light. To flourish, they need full sun and less than three hours of afternoon shade. The exception would be if you live in the South West. If temperatures regularly soar above 90, some sort of mid-day shade can be desirable, especially if nights don’t cool down significantly. Do not despair, however, if your growing space doesn’t have the optimal amount and distribution of sun, since the heat and light provided by sunshine can be augmented (or if necessary reduced) in various ways. Any sort of fence or barrier “behind” tomatoes will reflect sunlight and heat back onto them. 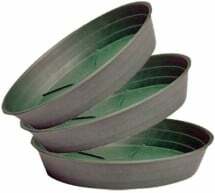 If your main concern is light rather than heat, then use bright or shiny materials. Something as simple as an old white sheet strung between sticks or posts will provide quite a good reflective surface. If you want to go high-tech, you can buy reflective mylar (indoor use only). If you’re primarily trying to augment heat, a dark, solid or semi-solid fence or wall, works best. This will heat up during the day and release heat at night. If, however, you’re growing your tomatoes in an open field where a fence or wall isn’t practical, try just the opposite, and put up something clear or white. A sheet of clear plastic or bright cloth will reflect back onto the plants some of the heat they lose at night. Draping Harvest-Guard® row-covers over plants of any age will create a miniature green-house effect, trapping heat and to some extent moisture. 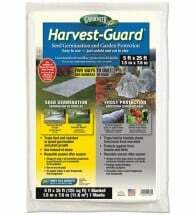 A row-cover is a gauzy material made for covering plants in spring to protect them from cold or from bugs. A sheet will have much the same effect, but it may have other less desirable effects as well: it’s a much heavier material, so it may damage the plants, especially in a high wind or when weighed down by rain. Also sheets, being densely woven, will keep rain from reaching plants except in a pretty heavy downpour, unlike row covers, which are designed to be water-permeable. So if you choose to use sheets or even blankets, it’s best to drape them over supports taller than the plants, and it’s important to check that plants are receiving enough water. The light lost to plants under row-covers is more than balanced by the heat gained. Protecting plants from heat: Though tomatoes generally love heat and sun, even they have a limit, so a long stretch over 95 F is not best for them. Lycopene, the health-enhancing, cancer-fighting pigment that gives tomatoes their red color, cannot develop at temperatures above 85 degrees, leading to the odd specter of green tomatoes in the middle of California’s Central Valley, which would seem to be tomato heaven. 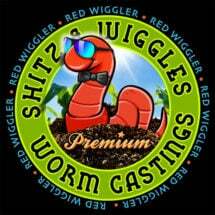 Strange as it may seem, in extreme cases, areas, or heat-waves, you may even want to provide some shade for your tomatoes. As mentioned above, this is not usually an issue unless you live in an area where the temperature does not drop significantly at night. It is uninterrupted high temperatures that cause real problems. If this is the case where you live, heat tolerant tomatoes can also be grown. Protecting plants from heat may seem straightforward (provide shade), but again there are some counter-intuitive twists. 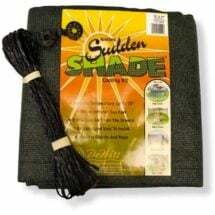 Simply covering the plants with cloth may seem the quickest and easiest way to provide shade. However, as noted just above, any complete cover also acts as a greenhouse, increasing the heat around the plant, so draping the plants themselves is not going to help. 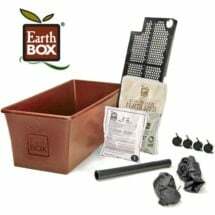 The trick is to avoid anything that completely encloses or covers the tomato plants during high summer. A sheet, row-cover, or fence between the plants and the sun is ideal. A row-cover spread only over the sunniest side of the plant(s) would be fine, since it would reflect away some of the sunlight (and heat) that would otherwise reach the plant, but it would also allow for air circulation, thus avoiding the mini-greenhouse overheating which in hot weather can be so damaging. Tomatoes will grow almost anywhere, but for a bumper crop, it’s best to provide them with a good start in the form of good soil. Even here in Montana, they’re not overly fussy, preferring a standard well-drained, moderately fertile loam and a middle-of-the-road pH of between 5.8 and 7.0. Unless you’re near lots of limestone, which will drive the pH up, or pines, which will drive it down, pH is not generally something you need to worry too much about. 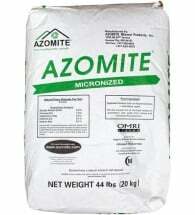 Even if you do have unusually alkaline or acidic soil, these conditions, like most soil problems, can be improved over time (see How To Change Your Soil’s pH). 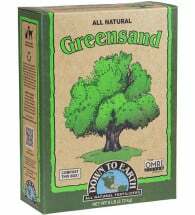 Soil pH is a measure of the acidity or alkalinity of the soil on a scale running from 1 to 14, with 7 being neutral. 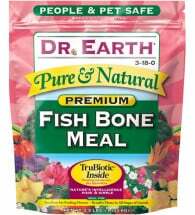 Higher numbers (8 is fairly high) indicate greater alkalinity and lower ones (6) indicate greater acidity. The scale works like that used to measure earthquakes, where each whole number represents a tenfold difference in severity or intensity. A pH measure of 6 is thus ten times as alkaline as is 5. Around 4 feet apart for caged tomatoes (those with a 2 foot diameter cage). Conventional companion planting recommends separating members of the same family, in part so that they cannot “share” or exchange diseases or pests. This policy dictates that potatoes, tomatoes, eggplant, and peppers all need to be kept separate and that none can be planted where any of the others were the year before — a small-garden nightmare. Sally Jean Cunningham, however, in a new approach detailed in her 2000 book Great Garden Companions: A Companion-Planting System for a Beautiful, Chemical-Free Vegetable Garden, groups tomatoes, pepper, and eggplants together, mulching all with black plastic and feeding all with blossom and fruit-promoting phosphorus. Potatoes are separate because they take a different mulch and because, not being primarily a flowering plant, they have different soil and fertilizer needs. Who knew plants could defend each other against pests and diseases? 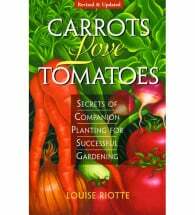 Carrots Love Tomatoes by Louise Riotte uncovers the natural magic of companion planting. Paperback, 224 pages. While people may argue about whether tomatoes really do love carrots or not, there are some things on which they do seem to agree. Tomatoes do well next to beans, peas or other legumes, as these deposit nitrogen, an important nutrient. You can go beyond “next to” in the case of bush beans, which can be planted around and among tomatoes, a practice called intercropping. 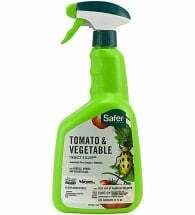 Basil also makes an excellent companion crop for tomatoes, because it helps repel a number of insects. Both basil and bush beans are ideal for intercropping with tomatoes in part because they are much smaller and can fill in the areas between tomato plants, thus crowding out weeds. One last tip for those of you with walnut trees: Do not plant tomatoes near walnut trees, which excrete an acid called juglone that inhibits the growth not just of tomatoes, but many other plants.